Go gently into that good night. When a sun-like star's nuclear fuel is exhausted, the core starts to shrink. The gravitational energy thus released heats both the core and the atmosphere even faster than the previously sedate nuclear furnace. 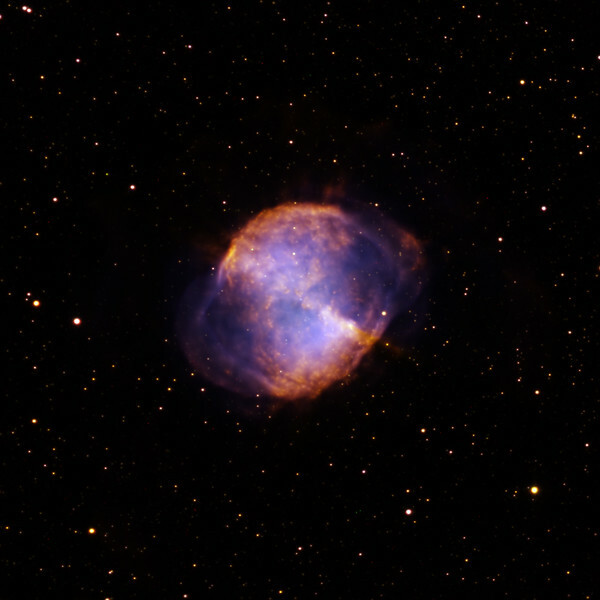 The atmosphere is expelled, leaving a naked very hot tiny core (white dwarf). The intense UV from the hot core causes the atmosphere to glow in H-alpha (especially in an outer shell) and O-III (especially near in). Binary companions, strong magnetic fields, and equatorial dust lanes conspire to produce beautiful and convoluted shapes, seen very differently according to our viewing angle. Dumbell nebula (M27) in Vulpecula. Green: H-alpha 9hrs; Blue: OIII 6hrs; Red NII 1hr so far. The NII luminosity is very strong, as strong as the H-alpha. The white dwarf is clearly visible as a tiny blue-white dot in the centre. 3nM Astrodon filters. FOV 18' arc, North up.